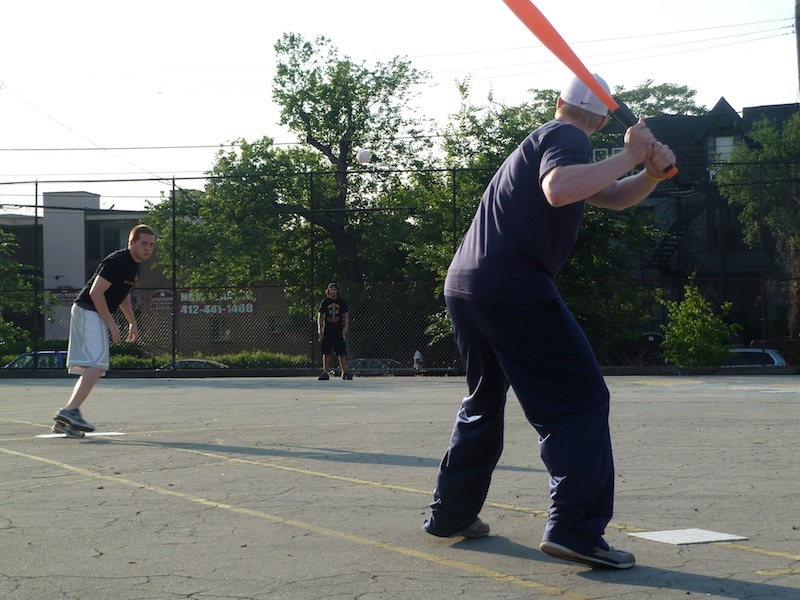 Dinger of Fish Sticks delivers a pitch to Luke of Pumice on Slow! Brad was a perfect 3-3 with two home runs and 3 RBI as he led Pumice on Slow! to a 5-4 victory over the Fish Stick’s in the first game of week 4. Each team sent their ace to the mound as Gaurav was throwing for Pumice and Dinger pitched for the Fish Sticks. Both hurlers got off to a good start, as Dinger retired the Pumice side in order in the top of the 1st and Gaurav retired Adam and Joey in the bottom of the 1st after giving up a leadoff single to Dinger. Dinger continued to mow down Pumice hitters in the 2nd, retiring Gaurav and Luke consecutively, and Gaurav once again retired consecutive batters after giving up a leadoff single to start the bottom of the 2nd. Tied at zero, Dinger sent John and Holly down in order to stay perfect through three innings. Gaurav gave up a leadoff triple to Joey to start the bottom of the third, and Blose drove in the first run of the game with a sac fly to deep right field. Gaurav retired Dinger to end the third and keep the score at 1-0. Gaurav flew out to center field to start the fourth inning, but Dinger’s perfect game bid ended at 3.5 innings when Luke hit a fly ball in between all the Fish Sticks fielders. Joey tried to catch it but came up short and Luke was safe at first with a single. John immediately made the Gay Fish pay for the fielding error with a two-run bomb, his first of the year, putting Pumice on Slow! up 2-1. Brad was inserted into the game for Holly, and delivered back-to-back homers for Pumice when he crushed a homer to center off Dinger. Gaurav flied out to the pitcher to end the threat, but the damage had been done as Pumice was up 3-1 through four innings. Gaurav retired Adam and Joey in order in the fourth to maintain the Pumice lead. Luke led off the top of the fifth with a single, and moved to second when John grounded out to left field. Brad singled to put runners on the corners, and Gaurav helped his own cause with a single, driving in Luke and extending the Pumice lead to 4-1. Pumice then batted out of order, as John grounded out to end the top of the fifth. Down three runs, Blose doubled to start the fifth for the Fish Sticks. Dinger followed with a two-run homer, his third of the year, to cut the deficit to 4-3. Gaurav wasn’t shaken, however, as he retired Adam and Joey in order to end the inning. Luke grounded out to start the top of the sixth, but Pumice added an insurance run when Brad hit a solo homer, his second of the game, to make the score 5-3. Gaurav grounded out to send the game to the final frame. The insurance run was proven crucial, as Blose hit a solo blast to start off the sixth for the Fish Sticks, cutting the score to 5-4. Gaurav then got Dinger to ground out for the first out of the inning. Adam singled to keep Fish Sticks’ hope alive, but Joey grounded out to center to end the game, giving Pumice on Slow! the 5-4 victory.